Through the Eyes of an Intern, No. 3: A foray into the world of plants /Hawks Aloft Inc.
I’ve always been interested in plants. I find that expressing a high level of curiosity, which is to say, any curiosity, about these non-moving entities of the great outdoors to any of my “normal” friends will typically elicit even more of an eyeroll than talking about birds. Usually, I make myself feel better by telling myself that I just have more interesting interests than they do. I blame this enthusiasm on my dad, who, bless him, has spent most of our hikes together pointing out all the intriguing flora to me and collecting seeds and whatnot. (Love you, Dad.) I know this is an organization dedicated to birds, but I thought I’d take a little time to talk about the plants and habitats that support avian existence. 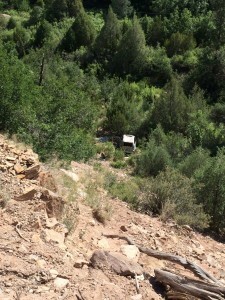 Random picture: Jennifer refers to this as “a popular drive-your-car-off-a-cliff spot.” It also shows the difference in vegetation closer and farther from the stream, though part of that is due to the steepness of the cliff face towards the bottom of the picture. A couple of weeks ago I went on my second field work camping trip, this time to the Valles Caldera and the Jemez area. It was gorgeous—of course. To me, I think of the landscape of northern New Mexico as lush, orderly, almost as though it’s intentionally well groomed, in contrast to the more unruly, freeform wilderness I saw in the southern half of the state. I’d guess that it probably has something to do with differences in vegetation. I’m no plant biologist, but from what I observed from the field work I’ve done, the Gila Mountains have a more oak trees and scattered bushes, whereas the Jemez forest has a fair amount of undergrowth between pines. These difference would be due to latitude, the distance north or south of the equator, as well as elevation. 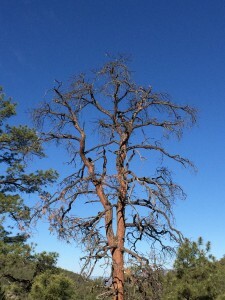 Ponderosas are rampant in both forests, naturally, and who doesn’t love these orange-colored, vanilla-scented giants? 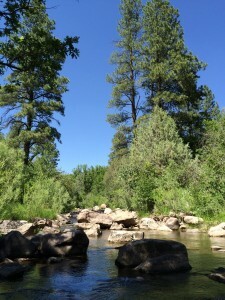 The Jemez work was four different bird surveys, done in point-count style. That is, you get a predetermined set of points, usually 10-12, spread out over a particular area, and at each point you stand for ten minutes and record all the birds you see or hear. Jennifer Goyette, the biologist who I shadowed on this trip, was patient enough to answer all my questions about identification and bird calls. Have you ever tried differentiating five or ten bird species in the same area by call alone? I admire people like Jennifer who can do it almost effortlessly and still have brain-space left to help me learn a few calls along the way. I can definitely recognize Black-headed Grosbeak, Spotted Towhees, Warbling Vireos, Yellow-breasted Chats, and possibly White-breasted Nuthatches after that trip. Thanks, lady, you’re pretty cool! Did I mention how beautiful it was? One morning’s work was along a stream near the Gilman Tunnels. The stream, like all water in the desert, created a strikingly green strip of land to either side of it. It’s packed with all sorts of flowers and bushes that wouldn’t be found anywhere else in this dry land, including what Jennifer calls “lemonade berry” (Rhus integrifolia). The berries were tasty and did not kill me, contrary to my initial suspicions/training that I should never put anything I find in the wild in my mouth (thanks, poisonous mushrooms, for making me paranoid…). The mathematical side of me is saying that there’s an inversely proportional relationship between the amount of vegetation found and the distance traveled from the water source—or, basically, there was a stark difference between how green the landscape was on opposite sides of the road. This also resulted in different amounts and species of birds found on either side of the road as well. For the most part, the side farther from the stream was fairly silent, while the closer to the water I looked, the more birds I could hear and see. It was a great day, especially because we ended our survey with a quick wade through the stream. Ah, so refreshing! 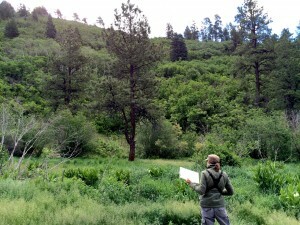 My favorite survey was the third because we actually got to do it within the Valles Caldera preserve. Despite the really bothersome cold I’d caught the day before, I could still marvel at the beauty of the landscape. 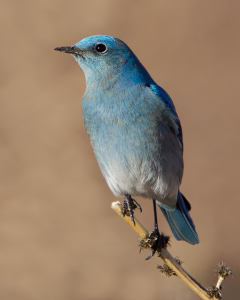 At one point, I was able to identify a Mountain Bluebird just by the way it flew out to catch insects near its perch, called sallying or hawking behavior. I can’t wait until I can better identify birds, whether by plumage, call or behavior, and I feel so lucky to be able to learn so much about birds this summer! Really enjoyed your post, Miri. Thanks for writing (and talking) about plants. I’m glad you enjoyed it, CC. I’ll try to mention plants once in a while, now that I know someone appreciates them in a post!